It goes without saying that an art center such as the Walker is the sum of many parts: from the physical structure that holds a variety of discipline-specific content and acts as a beacon for publics from the Twin Cities and further afield; to its programming team and support staff who ride the hamster-wheel of cultural production, feeding an expectant audience near and far. There are also the artists who create artworks and choose this place to be the hallowed ground on which they stand and are consumed, whether permanently (through entry into the collection), or ever so temporally. The Walker’s long history exists not only as a reference to what has been achieved, but also stands as a tangible entity that the institution needs to answer to in the present in order to push forth a legacy steeped in time. Beyond this, there are of course other unseen realities, functions and qualities that make up the Walker – the sobering forces of economics whether monetary or otherwise, the cultural capital embedded in our collection and the caché this offers amongst a broader art world. There are of course power relations and political forces implicit in all these aspects of the institution. Using these elements as fertile ground for discussion and collective thinking, the Interdisciplinary Work Group (IWG) has come together to assess the “pragmatic and more theoretical” concerns of engaging in and supporting interdisciplinary practices. This inquiry has been directed at both internal ways of working across programming teams as well as looking at how artists work today, which is in a manner that increasingly defies disciplinary divisions of performance, visual art, theatre, film/video. The group has been a somewhat self-sufficient initiative since fall 2011, inviting a selection of artists and thinkers to discuss interdisciplinary and collaborative practices and the spaces that support their growth and sustainability. During one such session, which I initiated, the group met with architectural theorist Eyal Weizman to discuss his approach to similar questions that have arisen through his research-led practice. Below is a report from writer Susannah Schouweiler on our conversations. I have taken the liberty to highlight the points in the text that I feel have a particular pertinence to discussions the group has had to date, namely foregrounding the fact that this process can play a part in ‘institution building’. The work of the IWG need not just be about assessing the status quo, but can be about working with our colleagues to formulate a departure from existing models into as yet to be determined future ones. 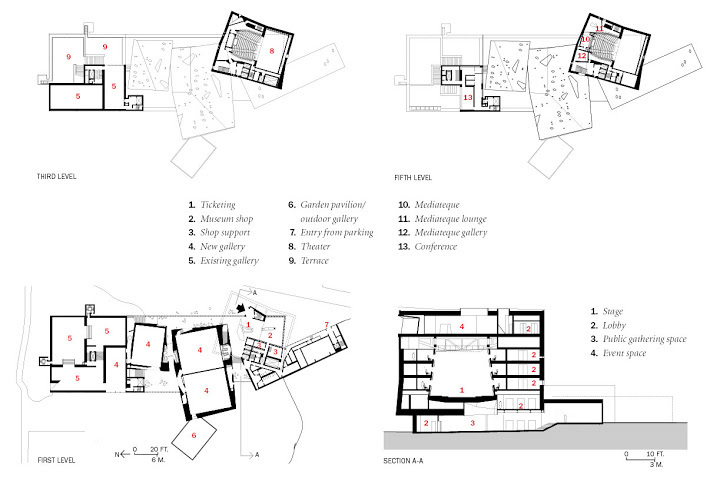 As a point of reference, I also want to call out two institutions that share similar profiles of having once been ‘multidisciplinary art centers’: the Institute of Contemporary Art , London and The Centre for Contemporary Art Ujazdowski Castle, Warsaw (whose recent project Office of Possibilities covers similar terrain to the IWG). Emerging from questions of how multidisciplinary art centers continue to function in a climate where disciplinary boundaries are transgressed and blurred, the two institutions have evolved new structures that attempt to bridge the gap between disciplinary departments internally and promote new models for supporting interdisciplinary art practice. I also want to direct your attention to another project, Department 21, which took similar pains to re-imagine another great institutional context that has gone through major transition in recent decades – the art school. A small group of Walker staff – researchers, educators, programmers and curators — convened in the center’s basement Art Lab last October to talk with Israeli architect, human rights activist, polymath artist and intellectual Eyal Weizman. All of us members of the Walker’s IWG, we met for an informal conversation led by visual arts curatorial fellow Yesomi Umolu, who’d invited Weizman to speak briefly with us. Umolu begins by asking us to consider Weizman’s varied practice – in ‘forensic architecture’, human rights advocacy, collectively produced, activist art installations in Palestine — with an eye toward “the pragmatics and challenges involved in fostering and sustaining institutional support structures for collaboration and interdisciplinary work.” She notes that “aside from his theoretical aptitude, Eyal has been quite successful at establishing productive arenas for exchange, carving out spaces for interdisciplinary work in both heavily bureaucratic settings (like the university)” as well as in settings more politically charged and restrictive, like his work in Palestine. After the introductions are complete, Weizman explains a bit about the origins and practical structures undergirding the practice and residency program of Decolonizing Architecture. D.A.A.R. was co-founded by Weizman, Sandi Hilal and Alessandro Petti, who currently manages the collective’s day-to-day activities and programs. The site, southeast of Bethlehem, has between three and 15 residents at any given time; the Delfina Foundation fully supports two of those residents, selected through an open, competitive process. By way of its residency program, the D.A.A.R. collective has produced work shown in biennales and museums around the world — the Venice Biennale, the Bozar in Brussels, NGBK in Berlin, the Istanbul Biennial, The Architecture Biennale Rotterdam, Home Works in Beirut, Architekturforum Tirol in Innsbruk, the Tate in London, the Oslo Triennial, the Centre Pompidou in Paris and many other places. Michele Steinwald, a curator of performing arts at the Walker, changes the direction of the conversation, referring to the more philosophical notions presented in Weizman’s talk the night before: ideas about art as truth-seeking, about the sleuthing, investigative work involved in “forensic architecture” and its slippery, aesthetically creative conclusions. She asks him to apply those insights to a question that’s been troubling her, to do with the implicit transactions involved in publicly presenting performance — transactional expectations framing the relationship between audience and performer, but also that of the commissioning institution and artist. Steinwald said she was curious how Weizman might “rupture” those expectations, re-negotiate terms and expectations on both sides to change the way work is created, presented and, ultimately, publicly received. Weizman responds bluntly: “I don’t know. But I’m fascinated by your articulation of this idea of a contract [between ticket-buyer and performer, commissioner and artist], and what might be involved in the breaking of the contract.” He muses, “I’ve written [in The Least of All Possible Evils] about the process of seeing as something that needs to be opened or ruptured.” As in the situation you mention, he says, “there’s a kind of transactional contract involved in seeing,” and it’s one, Weizman notes, that warrants deconstruction. Simply put: “What is in the ‘contract’ of dance performance? How might you present dance in such a way that disrupts that original, implicit contract [rooted in models and expectations of consumption], and which opens up new modes of relationality?” This isn’t so much an avant garde disruption of viewing you seem to be talking about, he says to Steinwald, as it is a shift in understanding of the “conceptual, political, intellectual” underpinnings of the work itself and how it’s conceived.